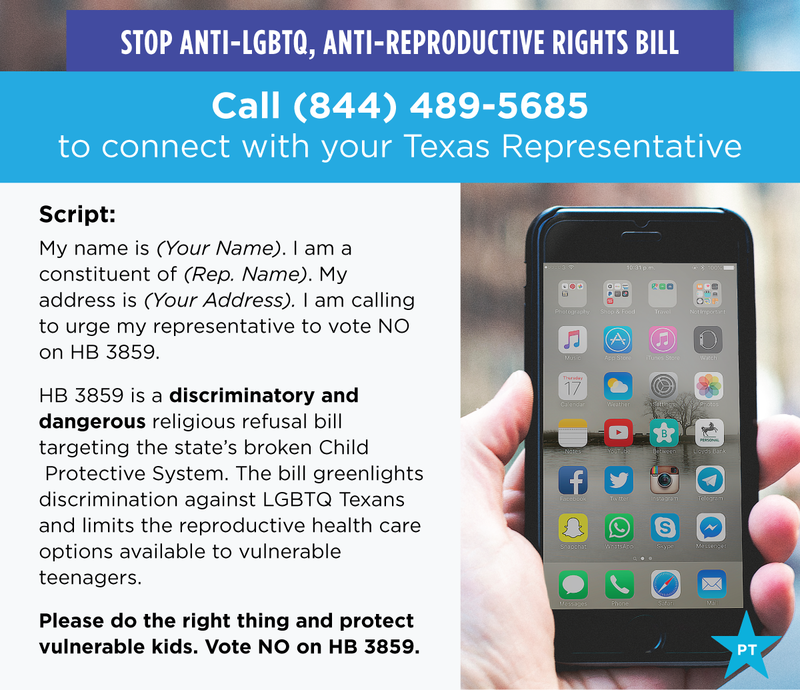 On Saturday, the Texas House of Representatives will debate and vote on a bill that greenlights discrimination against LGBTQ Texans and limits the reproductive health care options available to vulnerable teenagers. HB 3859 is a discriminatory and dangerous religious refusal bill targeting the state’s broken Child Protective System. The threats posed by this bill are even more disturbing given that state lawmakers are also reforming CPS this session by outsourcing many core social services for vulnerable children to faith-based organizations. Using religious belief as an excuse, a state-funded, private agency could deny placement of a child with someone who is gay, transgender, or a single woman. A foster family could actively obstruct a teenager from accessing birth control or an abortion. Call (844) 489-5685 now to get connected with your Texas Representative. Click here to look up your representative and ask the operator to connect you with their office.